This branch of mathematics is useful in the study of Science, Engineering, Economics and other fields. Can you tell quickly the number of direct connection between Mangaluru and Ahmadabad and between Belagavi and Vadodara? The right answer is 2 and I respectively! Let us read the following paragraph. On Monday the attendance in your class was 30 girls and 22 boys and seven were absent. On Tuesday the attendance was 28 girls and 26 boys and 5 were absent. On Wednesday the attendance was 26 boys and 27 girls and six were absent. Thursday was a republic day and there were no classes. On Friday the attendance was 30 boys and 23 girls and six were absent. On Saturday the attendance was 34 boys and 24 girls and one was absent. From the above data can you easily answer following questions? 1. Which day had maximum attendance? 2. Which day had maximum absentees? 3. On which day girls’ attendance was more than boys? 4. For how many days was girls’ attendance more than boys? 1. The numbers in six horizontal rows represent attendance details for a week from Monday to Saturday. 2. The numbers in the first vertical column represent the attendance of girls for six days. 3. The numbers in the second vertical column represent the attendance of boys for six days. 4. The numbers in the third vertical column represent the number of absentees for six days. Definition : A ‘matrix’ is a rectangular representation of data in rows and columns, normally enclosed within brackets. The horizontal representations are called ‘rows’. The vertical representations are called ‘columns’. In the Attendance example discussed above, Matrix A has 6 rows and 3 columns. It is called a 6 by 3 (6X3) matrix. 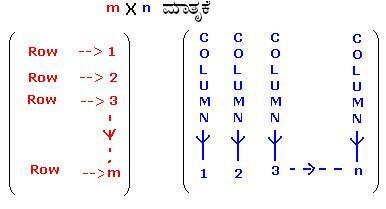 The order of a matrix is denoted by (m x n), where m is number of rows and n is number of columns in the matrix. In the adjacent Matrix B, the four sets of row elements are(p1,p2,p3),(q1,q2,q3),(r1,r2,r3) and(s1,s2,s3). 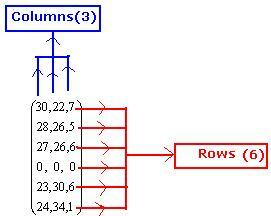 The three sets of column elements are (p1,q1,r1,s1),(p2,q2,r2,s2) and(p3,q3,r3,s3). Thus matrix B has 4 rows and 3 columns and hence is a 4 by 3 (4X3) Matrix.